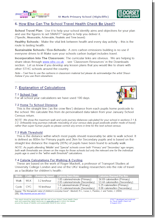 The School Travel Health Check Report and accompanying covering letter produced for each school in the LEA are perhaps the most publicly tangible and immediately useful output from our analysis process. 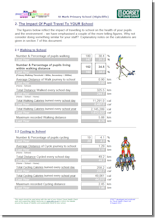 Carefully selected excerpts from the Analysis Output Data are incorporated into a bespoke Word file that is created for each school by mail merge between the analysis database and a standard template file that has been adapted (within reason) to include the authority specific logo and amended text. 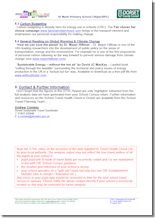 This is addressed to the school marked for the attention of the head teacher to enable reports to be put in envelopes and immediately posted to all schools via the authority internal mailing system once printed off. 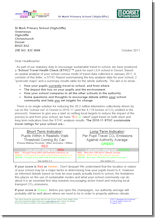 As regards the actual content itself, the standard letter template we provide puts the accompanying STHC report in context as well as allowing for pertinent, authority-specific content to be included like urls of further resources and the names and details of individuals that the school needs to contact for further information. 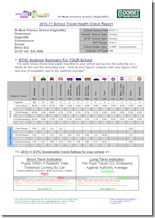 The overall sustainable travel rating for the school is also included (Green is >10% below authority average; Amber is within 10% of authority average; Red is >10% above authority average), however there are also suggestions on what schools should do next for each rating to keep the overall tone as positive as possible. Clients can of course adapt the letter as they see fit e.g. discussing how the STHC fits in with their own overall service delivery to schools. One of the consistent features that our analysis uncovers is the large discrepancy between the total distances currently travelled by pupils to their chosen school and the distance they would travel if they went to their nearest eligible school (based on their national curriculum year). The latter figure represents the minimum possible total travel distance for all pupils for the current situation, and hence gives a realistic upper figure for how much can be achieved. 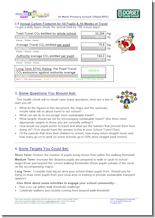 This section in the report tabulates the “hard figures” for this difference for the authority, expressed in both kilometres and kilograms of CO2 emitted, by way of highlighting the significant contribution that choice makes to the overall total child miles for school travel. 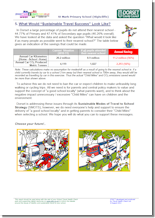 In all authorities analysed to date the total distance travelled by car would be reduced by over 55% if all pupils attended their nearest school – and that’s without taking into account any modeshift as a result of attending a closer school). This section gives the sources of the various factors used in our analysis calculations. We try to use “definitive” figures wherever possible in our analysis, Thus the carbon factors used to turn travel distances into CO2 emissions are those issued by DEFRA, whilst the “calorie factors” are taken from the work of Roger Mackett, a professor of Transport Studies at University College London and one of the UKs’ leading researchers into the role of travel as a facilitator for children’s health. The final section of the report lists resources to further help the school investigate and debate the issues raised by the STHC. 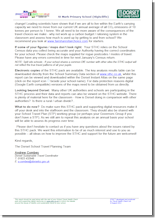 Abridged comments from Robert Thompson, Business manager Policy and Plans, Atkins Transport planning, commenting on the contribution the STHC has made to the South East Dorset multi modal study (underpins LTP3 and MAA).